Everyone obsesses about something from time to time. Who hasn’t looked in the mirror and wished they could snap their fingers and instantly change something about themselves? As part of the POPSUGAR Insights 2014 Healthy Living Report, we asked women to tell us what part of their image they obsess about the most. 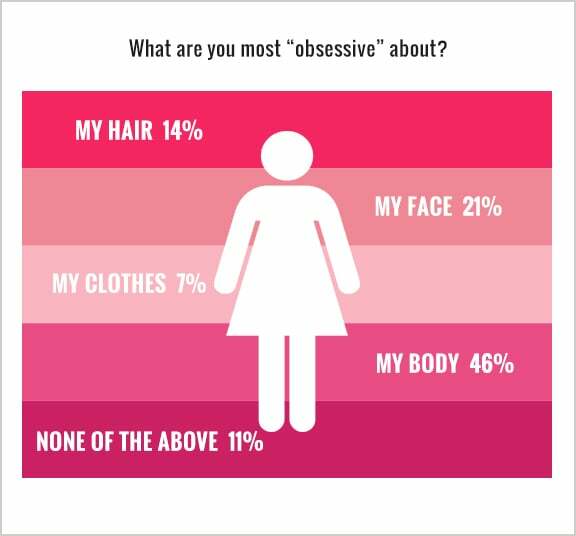 Overall, 46% of women said that they are most obsessive about their bodies. An obsession with their body was the No. 1 response of women regardless of their age, life stage, employment status, or region of the country where they live. Savvy brands can take these obsessions and focus on the positive aspects of attention by providing fresh and credible takes on how best to lose the negativity, focus on the motivational aspects of wanting to improve, and provide engaging and profound healthy living content that helps women turn their obsessions into positive impressions.